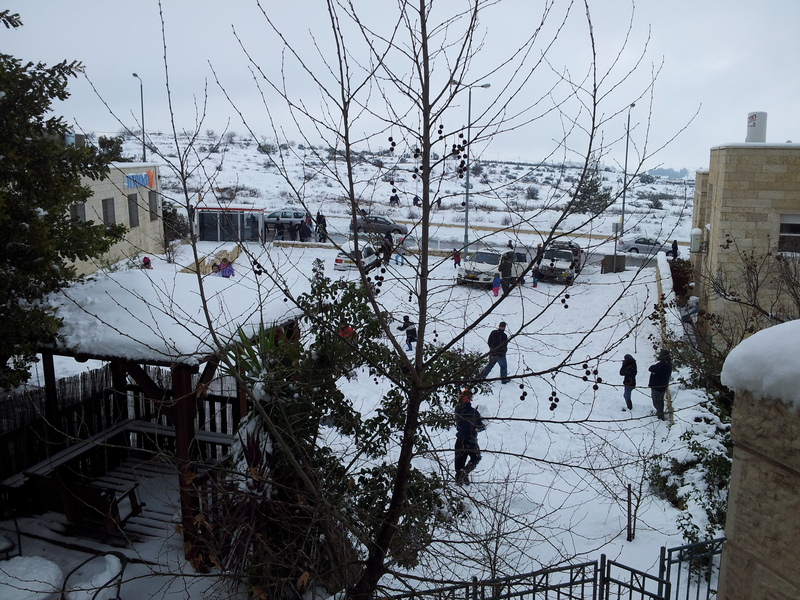 The phenomenon of snow in Israel is something to celebrate. 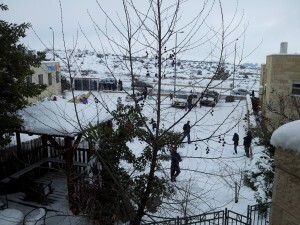 The experience of a huge snowfall here though , which happens once every few years and lasts for about one day, is like watching “It’s a Wonderful Life” in real life Gush Etzion. Kids are up at the crack of dawn making snowmen, knocking on doors asking for carrots to use as their snowman’s nose. Whole families are sledding down the streets, snowballs are flying everywhere. Everyone stays home from school and work because the roads are closed. The most prominent professionals are organizing and playing football on the community field/court with every age imaginable. They’re tying bags around their shoes and wearing latex gloves on top of their knit gloves to keep their feet and hands dry for the one day that the snow will last. Everyone is smiling, laughing, and rolling in the snow. It’s a real snow day. As soon as the roads are open, families come from all over the country to see and enjoy the snow, which only falls in areas a certain height above sea level (We’re +900 meters above). 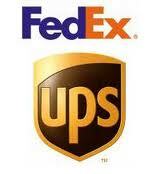 They come from Beit Shemesh, Ashkelon, even as far as Tel Aviv! 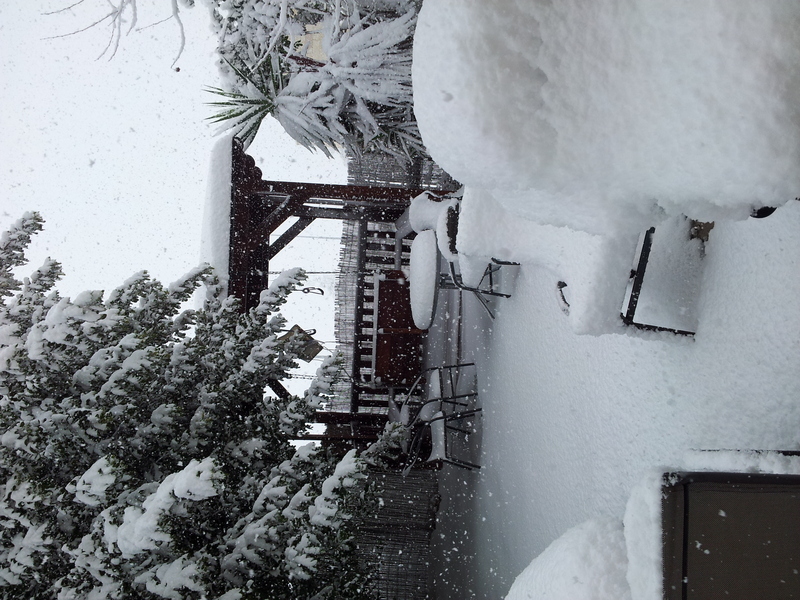 Having grown up in Chicago, I’ve seen enough snow to last me a few lifetimes. So while my entire family (including my dear husband, who grew up in Miami Beach) is playing out in the snow, I figure I’ll enjoy the quiet inside. I have a ton of work to finish, so I set out to be productive and accomplish today. Everyone walks into the house at different moments to warm up, to change their shoe bags, to get a drink, whatever. I find myself wiping the floor, straightening up the gloves, hats, and scarves that inevitably end up on the floor after being hung up to dry on every household object imaginable. And then they need something hot to drink. So I take out the stuff for hot chocolate, prepare a yummy carrot and rice soup, and try to think about what everyone will eat for lunch, dinner, and then oh! Tomorrow’s Friday! I need to plan shabbat meals as well. Needless to say, none of the work I planned to do is getting done. By tomorrow, everything will go back to normal, and I will be a day behind. Today will not be a productive work day. I will not accomplish too much. 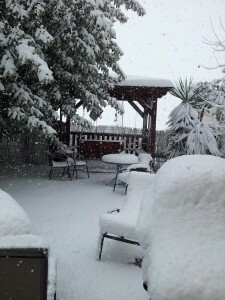 But, I have to say, it’s all worth the happy memory of our one real Snow Day that only comes once every few years. The excited smiles I see on my children’s, neighbors’, and my husband-turned-little boy’s faces are worth a million productive days. Beautifully written and what a beautiful day! Ma rabu maasecha.